A staple in GongGuan, this place has been here for years, and I hope it continues to stay there forever! 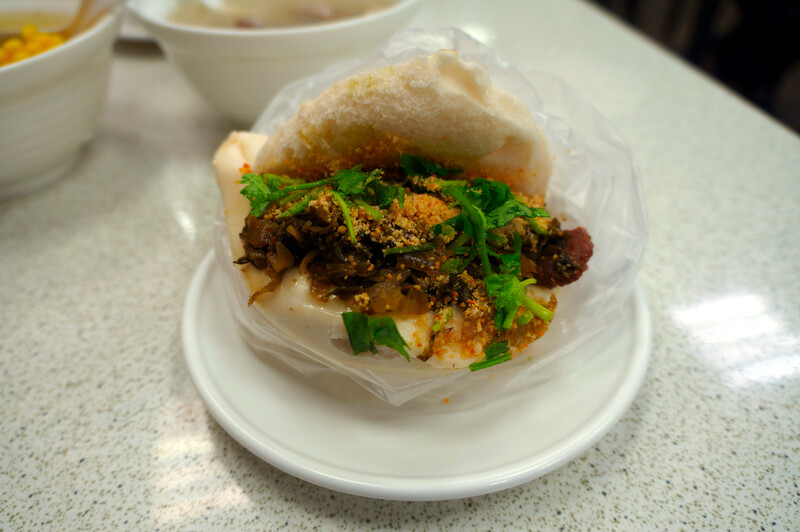 Steamed buns are filled with a delicious mix of fatty and lean pork, topped with pickled mustard greens, peanut powder, and coriander. I’ll be honest, getting a picture of this was difficult before I essentially inhaled it. The pork is just moreishly rich, and pairs wonderfully with the peanut powder and fresh coriander. All encased in this fluffy steamed bun, and it’s an absolute winner! However, if pork and sweetcorn aren’t your thing (then who are you! ), then you could try out this intestine, adlay, and lotus seed soup – there’s a slight Chinese medicine flavour going on here, with some tasty offal in there, too.